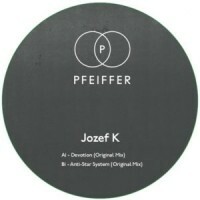 Pfeiffer’s fourth release brings a prolific UK producer to the fold, Manchester’s own Jozef K. A-Side track “Devotion” is a straight up club killer - resplendent with 90’s house flair, you can definitely feel Mr. K’s early acid house connection with Manchester institution the Hacienda in this jam. Already racking up support from Kim Ann Foxman on Boiler Room, this cut is sure to continue setting dancefloors alight across the globe. On the flip, “Anti-Star System” (taken from Daft Punk’s mistaken translation for the word 'underground') is true to Jozef’s underground roots with jacking 909 drums and uplifting old school piano hits.